I had my eye on this game for a while now,i think it looks very interesting. Comes out on January 15 on PS4. With that atmosphere and sound it looked like it would have been an interesting VR title. Missed opportunity. HOLLY!!! I like what I'm seeing here. It does look pretty intriguing. I was looking forward to this game. It comes out in just over a month! Great news! I guess January going to be another busy month for me. Wow finally. I still remember that clip from ages ago with the lightning in the desert and the flying around. I thought that said Valve (New Announcement.) Even my eyes play tricks on me. is this a puzzle game or a walking simulator ? Are you just going to call everything “walking simulator?” Do you even know what’s that even mean anymore? Is every game “walking simulator”? Because most games your character is going to walk at one point or another even games like Bayonetta and Resident Evil 4. I bet they think this song is about them. The trailer clearly shows you do mare than just walking and you even transform to crow. Best art direction I've seen all year. Lovely work. Looks like a thatgamecompany-ish game. Looks really interesting. Reminds me of RIME. Which was great. The music in the announcement trailer is godly as well. This. and works great for me, I love that type of game. 1 more week and downloading. Definately going to buy it. Came for the Lunar, left disappointed. Looks like a darker Rime. The art style is similar to that at least. I'm interested. Looks cool. Getting a PlayDead vibe from it. Reminds me of Inside to a degree. Damn it seems i have the memory of a fish.I completely forgot it comes out in just a few days.Thanks IbizaPocholo. Day 1 for sure because i want to support games like this. Downloading it tonight. Will report back with early impressions. I have also pre-ordered it (it currently says "calculating") but my current internet connection is terrible so it will take a while to download it. It may be inspired by Ico but i wouldn't call it a "clone". And you wouldn't either if you actually watched any gameplay. Looks gorgeous, if the game is half as good as the art direction it should be awesome. Traded my PS4 so I won't be playing anytime soon, but for those that do get to play this game -- enjoy! Reporting back after 45 minutes in. Regret to say that I am very disappointed so far. Like, very much. I am still in the first area gliding through the dessert and trying to solve the very light puzzles scattered around the place. The initial concept is somehow similar to Journey but technically is so bad that is not even funny. - PS2 textures (being generous) with some gross popping despite there screen is empty and free of objects most the time. Lot of illumination glitches too. - The "shoulder perspective" when flying is cool on the pictures but on the actual game it makes it difficult to manouver with severe framerate drops. Journey was fluid and intuitive, in its simplicity. This one feels the opposite. The game has to be patched ASAP. So i played for an hour or so (taking my time exploring and taking-in the setting) and i'm in the second major area of the game (not including the intro). 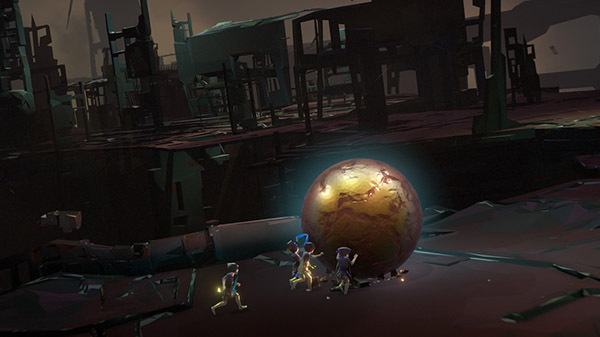 Just like games of similar design values (Ico,Rime,Journey) you'll either love it or hate it. If you are a graphics whore like poster #33 of this thread and you can't stand anything less than 4K/60 fps and super smooth controls then you are playing the wrong game. I haven't experienced any major framedrops to the point that it becomes unplayable (and i'm playing on a PS4 slim) but it really depends on how easily you let trivial things like that (especially in a game like this) to annoy you.The controls of the bird take a few minutes to get used to but after that i had no problems whatsoever. However if you're someone who can appreciate a unique atmosphere and setting,great art direction and you're willing to let the game immerse you in its world then i think this is one game that you'll enjoy. I can't have a solid opinion about it yet but i like how it goes so far and i want to learn more about what's going on. Can't wait to play more tomorrow. Excuse me, it's not about being a graphic whore but demanding a game that doesnt crumble technically. Your assumptions are borderline rude. I can appreciate all that you say and those games you mention are fluid in their controls and dont have the problems I have encountered here. I love games like Abzu, Gris, Journey or Ico (Rime I didnt like) but they are not all the same. The game has to be patched whether you like it or not. It's not about not being "beautiful" but having things like long loading times and popping fixed. Ico is the most similar reference to this one and still, both the controls and graphics were more stable than on this game, released in 2019. Well i'm sorry if i was being rude but in all honesty you sounded exactly like that in my opinion. If i didn't played the game myself i would have dismissed it as unplayable trash based on your words alone but thankfully i've played it and the game is nothing like you said.Even without the day 1 patch. Which means to me that you are someone who can't stand playing anything less than AAA games or extremelly polished "indie" games like Journey which had a much bigger team and the money of Sony behind it for years in order to come out as it did. Vane was made by 5 people over the course of 4 years and based on that the technical side is more than acceptable to me.Like i said i'm playing on a PS4 slim and i didn't encountered any severe framedrops that made the game "unplayable" as you said or any super long loading times.And for God's sake what was the problem with the controls?It only takes a few minutes to get used and understand how they work.Yes they could have probably made the bird behave more responsively and let you control it with a higher precision but then it would have felt like a drone and not like an actual bird. This is not Devil May Cry.It doesn't need 60fps and super smooth controls in order to be able enjoy the experience. It saddens me to see (and this is not directed only towards you) that there is a trend among a lot of gamers today,who have stopped appreciating the games for what they are (gameplay,level design,art direction) and the only thing they care about is for EVERY game to have the highest resolutions and textures and framerates possible in order to enjoy them. I completely agree. Technical merits are far less important than overall experience. Obviously if somebody is extremely concerned about performance and fidelity that may get in the way of finding that good experience, but I'd argue it would be a case of them creating a rock for their own back. Over the years I've had some great times with games that looked crappy and/or ran poorly, on the other hand I've also been thoroughly unimpressed by the playability of some games that were technical and especially graphical power-houses in their day. Naturally there's a limit to all this, and its reasonable to take issue with a game for running/presenting poorly, but it needs to be considered in context and proportion. I don't believe its doing anyone any favors to obsess over performance and graphics. This game looks interesting and i can ignore some low-res textures/meshes but some of the objects look like they have no textures at all. Just flat colored planes. It's part of the game's art style. Surfaces may not have actual textures but have various subtle color gradations that if you look from far away they make the surfaces look as if they were hand-painted. Personally i really like this style. ...look like they have no textures at all. Just flat colored planes. Regardless, I would like to play the game someday. Yikes. I’ve had my eye on this, but after some of the impressions by posters above and these reviews, I’ll wait for a price drop. $25 is a lot to drop for a game with some of these technical issues and design flaws (specifically, the awful save system paired with game-crashing bugs).